The use of perioperative surgical wound dressings is an important factor in the mitigation of infection following total joint arthroplasty (TJA). Few studies have been published comparing wound dressings and infection rates after TJA. Researchers conducted a systematic review of the existing literature published between 2006 and 2016 on total hip arthroplasty (THA) and total knee arthroplasty (TKA) surgery and associated rates of post-operative infection and types of dressings used. The primary outcome was to compare the infection rate of Hydrofiber® dressings to that of both Standard Dressings and Absorbent dressings. 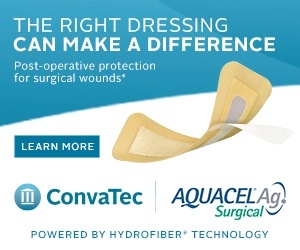 Analysis of the studies revealed that the rate of infection was approximately 3.4x lower for patients treated with Hydrofiber® Technology compared with standard wound dressings and 3.9x lower compared with absorbent dressings. This analysis suggests that dressings with Hydrofiber® Technology (silver and non-silver) may be significantly better than both standard gauze and absorbent dressings in reducing associated post-operative infections in patients after TJA, thereby helping healthcare professionals control costs and improve outcomes for patients. To download the PDF for ‘Meta-Analysis Indicates Hydrofiber® Dressings May Lower Post-Operative Infection Risks After Total Joint Arthroplasty’, please provide us with your contact information.